I live at Winston Churchill and Britannia and have a spare room to rent in my townhome. It is furnished. I have a second room with just a desk if you need extra space to work. You would have full access to my kitchen, laundry room, finished basement with television, living room with television, driveway for parking, and backyard (townhouse size) to use. You would provide your own food, laundry detergent, and any other personal necessities. Grocery shopping, malls and the hospital are all very close. If you use Mississauga Transit, bus stops are within steps of my home. UofT Mississauga campus is a short bus ride away. Absolutely no smokers and no pets please. Internet and utilities, other than telephone, are included. 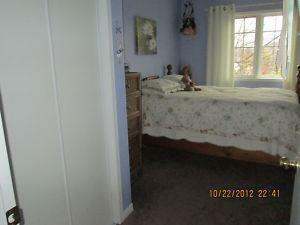 I am very personable, my home is pretty and quiet, and I look forward to hearing from you.